The past few mornings have greeted us with dense fog hiding the Rhein and most of the town we find ourselves in. In the woods, the fog creates a surreal, somewhat spooky, if not beautiful, vision. Walking on the path through the fog is a great experience, with the fog blanket disguising normal objects and limiting our view to our immediate surroundings. Rheinbrohl and the Rhein River. 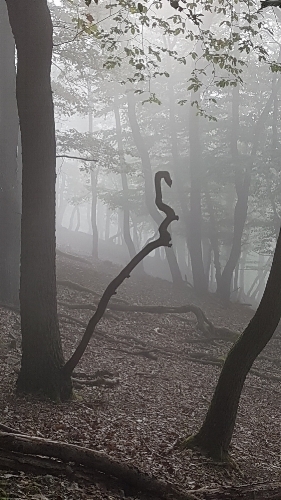 We found Don Quixote on a ridge overlooking the fogged in Rhein. Also a bridge leading the way to Rengsdorf. Lots of ruins, towers, castles, and mansions along the way.